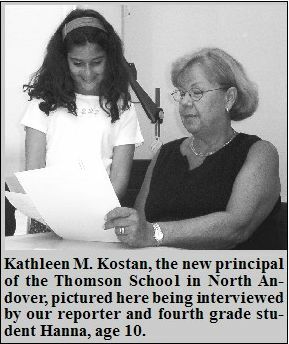 Our new ace reporter, Hanna interviewed (Kathleen Kostan) the new principal of the Thomson School in North Andover. How do you feel about MCAS? Are we still going to sing the Thomson School Song? Are we going to dissect in science class? How long are you going to stay in the North Andover Schools? Do You Live in North Andover? How do you feel about being a principal? “I love being a principal! The best part of my day is doing just what I am doing now. Talking to young boys and girls, watching them learn and grow into young men and women. Some parts of it are not that fun, like doing reports to the state, but I do like being a principal because I am always learning just like you. Most of it is really fun.” What is the difference between being a teacher and being a principal? Do you support peer mediation and not involving parents? Next Month Hana will be interviewing Lawrenc School Superintendent Wilfredo Laboy.